Just read reviews, look at photos and check out location, then you will want to book it. Totally awesome views from every window, very spacious,1300 square feet on one level, a three block walk to downtown restaurants. Adjacent shopping for basics make this one of the best vacation condos in town. We include a parks pass which will save you a good bit of $. Basic cleaning allowance of 3.5 hours is included for stays of 4+ days which is sufficient if you help just a little before you leave. Our Canadian home is beautifully furnished and can comfortably handle several adults or a family with young children. Our guests have told us that this condo is simply first class. Please click on the ''comments'' button at the end of this description to see what guests have written in our guest book. A one level, open floor plan creates a very spacious and comfortable space that can handle several people without feeling crowded. 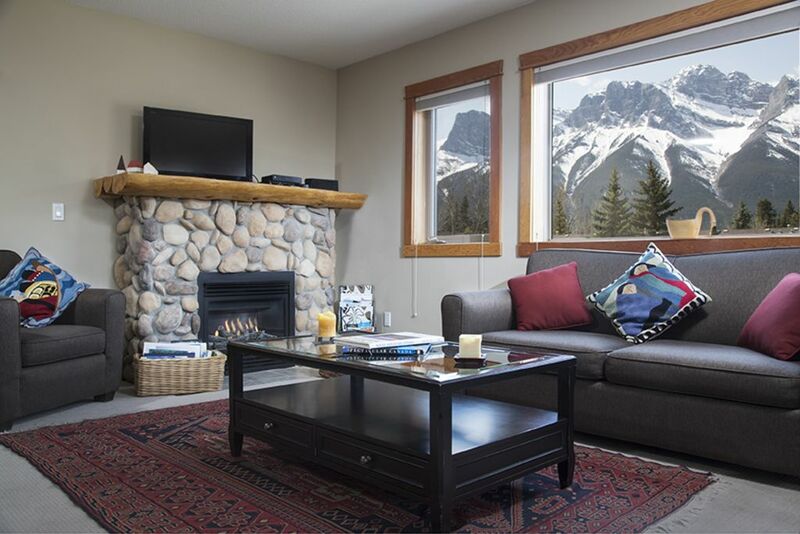 It is a corner unit which has a view of 50 miles of spectacular peaks from Cascade Peak and Mount Rundell in Banff past the majestic Three Sisters in Canmore. As you can see in the photos every room has stunning views. My wife Cathy and and I live in Longmont, Colorado,,35 miles north of Denver. She is a retired attorney and I retired after 33 years as the Executive Director of an organization that provides help to low income and homeless families. Although we love Colorado and feel blessed to be here we fell in love with the Canadian Rockies a few years ago and were fourtunate enough to buy a spectular place in Canmore. We were the second person to buy in our building a year before construcition began so we were able to get 'the best' floor plan and views. Everyone who stays says the pictures don't do the views justice. We love sharing it with others. I love taking with people about Canmore and our property so feel free to give us a call with any questions. Canmore is just stunning and the small town feel is much more relaxed than Banff. Things are not as expensive as Banff either. We also love the miles of trails in town that are along Policemans Creek and the Bow River. Access is just across the street from the condo. location, location, location!!! Access to downtown, grocery stores and other shops. Trails right across the street make you feel like you are in wilderness. Really! And, roof top hot tub has most stunning views of valley and peaks of anyplace in downtown. THE VIEWS ARE THE BEST YOU WILL FIND. You see 40+ miles of nountains, past Three Sisters to east,northwest to Cascade Mountain in Banff-and beyond. Read what guest have said. Good stay, lots of space, great location! Pros: amazing location near downtown, and the kind of stores you are likely to need (groceries, alcohol, etc etc) are just few minutes walk away, has underground parking, the condo was very spacious and had great views, and the condo was generally well kept and appointed, and the park's pass is a great savings if you drive to Banff! Cons: the code we were given to get into the parking/use the elevator didn't work and the key fob for the hot tub was not in the condo (we called the management person as listed and they gave us a code and a fob very quickly, so that was great), the sunlight will heat the condo a lot so keep those shades drawn during the day, and we found the electric lock on the door to be finicky some of the time. Really glad to enjoyed the place--location, views, spaciousness, etc. I do apologize for confusion about entry codes and fob. The management company just made those changes (codes, fobs) the day before you arrived. I thought I had sent update codes to you but apparently did not get to you in timely way. You got caught in the transition. Ouch! Going forward guest will have new codes in welcome letter I send to all guests. Happy travels. It is in a ideal spot. The unit is spacious, clean and well equipped. It is also located close to downtown, a grocery store, and a great recreation facility. There was nothing about this place not to like. Thanks for the kind words. Glad you enjoyed the condo and the location. We absolutely loved staying here! It is hard to find a better view. The condo is much more spacious than the pictures show. The location is excellent and having the underground garage was extremely nice, especially the mornings which it was -10F. The kitchen was well stocked and was very convenient having the Safeway right there. Absolutely loved staying here and would recommend others to as well. I also appreciated all the info provided by the owners, we were able to do 2 of their recommended hikes and loved them. The only issue we had was with the heat, but it seems like that was coming from one of the retail places below. We set the thermostats really low and didn't feel any heat coming from the heating units, but the rooms got really hot, had to sleep with the windows open. So glad you loved the place and let folks know it is even more spacious than pictures indicate. Regarding heat I am wondering if the in floor radiant heat in kitchen and baths (which is nice) might have been set on high? It operates on a different system than regular heat. Appreciate the heads up and will have housekeeper check it out. Might need to add info about how radiant heat works in the welcome letter I send with all the other info. Always can improve. Glad you did a couple of recommended hikes and enjoyed them. Thanks again for staying at our place. And, also glad you enjoyed the views............stunning, eh? Beautiful condo, well equipped and clean. Great location, could walk to downtown with the many quaint shops and great restaurants. The view of the mountains from the condo was stunning. Thanks for a wonderful stay. The views really are stunning aren’t they? Glad you enjoyed them and the location. What a beautiful condo in a perfectly convenient location to get to Banff and the other national parks. The condo is clean with kind touches left for us (bottle of wine, artfully folded towels, paper and cleaning products). The condo is large and comfortable, loved the small deck and the roof top hot tub and work out room. We even had the use of a national parks pass which saved us a lot of money and allowed us to visit often. Getting in and out of the condo with codes was easy and convenient. As some other reviewers mentioned, it is located on a busy street but the views are still fantastic and the noise did not bother us (and the shopping plaza came in very handy). I also loved the town of Canmore which is walkable from the condo - in fact, preferred Canmore to the town of Banff. Loved this condo, loved the location, the owner was helpful and responsive to all messages. Would love to visit and stay again! Thank you! In addition to the stunning scenery Canmore has a wonderful variety of unique locally owned restaurants and shops. No mall with the stores or eateries you seem to see everywhere these days. Although the restaurants are great we find ourselves cooking in the very well equipped kitchen most nights. A new Safeway and an upscale Soby's market are next door. If you do want to eat out the eateries are a three block walk away. Extra charge extra for groups with more than four adults $15/day for up to 6 adults total. A 3 hour cleaning allowance it included. The housecleaner is very efficient and can get it done in that time if you leave the place in good shape. And, it is a respectful thing to do..............good karma for you. If it takes her longer $50/hrUS will be deducted from your damage deposit.